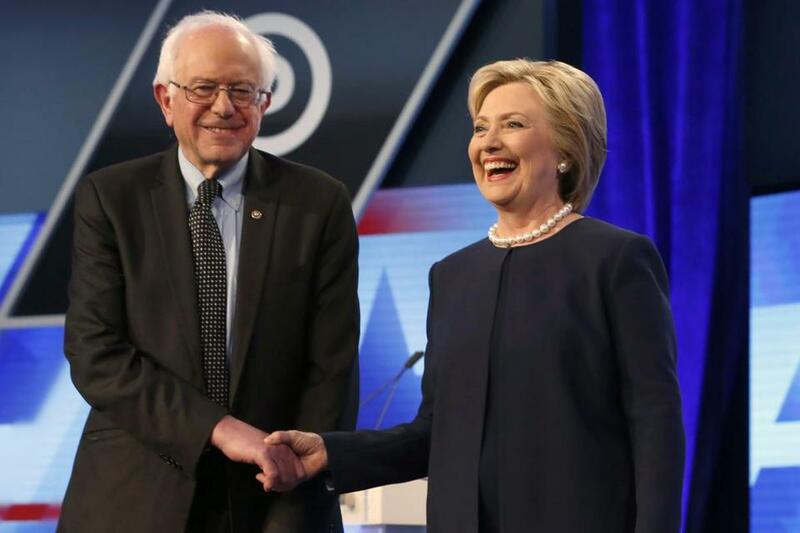 Bernie Sanders and Hillary Clinton shook hands before the start of Wednesday’s Democratic presidential primary debate in Miami. MIAMI — Hillary Clinton was forced to grapple with many of the weaknesses in her campaign during a debate Wednesday night when she was pressed on an extensive list of factors dogging her candidacy. Moderators pointedly asked her to respond to her surprising loss to Bernie Sanders in Michigan this week, her poor poll numbers on trustworthiness, the deaths of Americans in the 2012 Benghazi attacks, as well as the controversy over her personal e-mail server and the investigation it spawned. Sanders, who has generally shunned the latter subjects, stuck to his script of pounding the Democratic front-runner over her paid speeches to Wall Street, corporate campaign contributions, and deep ties to the Washington establishment. The Miami debate, co-sponsored by Spanish broadcaster Univision, also focused heavily on immigration and other issues of high interest to America’s growing pool of Latino voters. In response to a question, Clinton declined to say whether she would drop out of the Democratic nomination contest if she is indicted for mishandling classified information connected to her e-mail system, which she maintained while she was secretary of state. 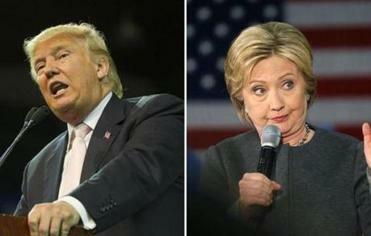 The problem for Donald Trump and Hillary Clinton: pesky primary rivals that just won’t go away. Some of the sharpest exchanges between Clinton and Sanders came on immigration reform. Clinton criticized Sanders’ reasoning for voting against a 2007 immigration reform bill that was championed by the late Senator Edward M. Kennedy of Massachusetts. Sanders has said he followed the guidance of advocates who likened a guest worker program to modern slavery. Sanders countered that Clinton prevailed upon former New York governor Eliot Spitzer to reject a driver’s license program for illegal immigrants. “New York still doesn’t do it,’’ Sanders said, while noting that Vermont does permit the practice. Much has shifted in the race since the two candidates last met on a debate stage just 72 hours earlier. Sanders unexpectedly beat Clinton in the Michigan on Tuesday, raising fresh questions about her ability to reach white, lower-income voters. The victory gave Sanders a fresh boost as he looks ahead to a trio of industrial Midwestern states — Illinois, Missouri, and Ohio — that hold primaries on March 15, along with Florida and North Carolina. While Clinton’s 200-plus lead in delegates makes it complicated for Sanders to prevail in the nomination contest, the momentum he’s showing will force Clinton to continue spending time and money on the primary. She’s signaled repeatedly that she’d prefer to focus her fire on the Republican front-runner, Donald Trump. Democratic strategists allied with Clinton have studied Trump’s rise and concluded that the Republican field waited far too long to take him on. She also showed some humor, playfully mocking Trump’s central campaign theme that he would build a wall between the United States and Mexico. Trump, along with the three other candidates left in the GOP field, are set to debate in Miami on Thursday evening. Clinton took the toughest questions Wednesday, befitting her status as the front-runner in the Democratic contests. At one point Clinton found herself defended her shocking loss in the Michigan primary on Tuesday by noting that she won Mississippi, which also voted, and took home more delegates than Sanders. She said that it is “painful” to see the poll numbers that show many Americans don’t believe Clinton is honest. “I am not a natural politician in case you haven’t noticed like my husband and President Obama,” Clinton said. Another sensitive topic to come up was the 2012 attacks on a US diplomatic compound in Benghazi, Libya. Democrats have not made an issue over the deaths of four Americans on Clinton's watch — but moderator Jose Ramos pressed her on whether she lied to the family members of the victims. “We were scrambling to get information that was changing literally by the hour. When we had information, we made it public, and sometimes we had to go back and say we had new information,” she said. Sanders was called on to explain how he could possibly clinch the nomination given the deep deficit he has in the delegate count and among party leaders who also vote in the selection process. “In the coming weeks and months we’re going to continue to do extremely well, and convince super delegates that Bernie Sanders is the strongest candidate to defeat Donald Trump,” Sanders said. In a nod to the near sea-level location of the debate, moderators pressed both candidates on their views on climate change. Sanders’ answer resonated on social media as one was one of his strongest responses of the evening. “When Republicans say climate change is a hoax, they mean they don’t have the guts to stand up to the fossil fuel industry,” he said. Sanders is training his sights on the upcoming primaries in Midwest states. As he did in Michigan, he’s contrasting his record opposing trade deals with Clinton’s more nuanced positions. She has supported several bilateral deals and her family legacy includes the North American Free Trade Act, which was enacted during her husband’s presidency. The 1994 trade deal with Mexico and Canada is still reviled by chunks of the Democratic base. Clinton drew blood during Sunday’s debate by accusing Sanders for voting against the auto industry bailout, an attack that fact checkers have since called “half true” but on Wednesday night Sanders still had difficulty batting it down succinctly. “What the secretary is doing tonight and has done very often is take large pieces of legislation and take pieces out of it,” he said. “No, I did not oppose the bailout or the support of the automobile industry,” he added, getting flustered. It wasn’t clear at the time that the bill Sanders voted against — the Troubled Asset Relief Program — would be the vehicle for bailing out the auto industry. Only later, after a separate bailout failed, did Obama reroute some of the cash to help domestic car and truck makers. Sanders struggled to explain that distinction. Sanders has struggled to attract support from minorities, but has had better luck winning support from Hispanics than blacks. Clinton’s advantage with black voters has given her a sizable delegate lead — and she’s counting on continued support in North Carolina as well next week. During the most of the debates so far she’s tried to appeal to African-Americans by wrapping herself in Obama’s legacy, stressing that she’s best positioned to continue his policies. However, she broke with Obama on his administration’s policy of conducting raids on undocumented immigrants and deporting them. Annie Linskey can be reached at annie.linskey@globe.com. Follow her on Twitter @AnnieLinskey.